Read this page for installing and setting up the environment for developing and deploying EJB 3.x on JBoss application server. 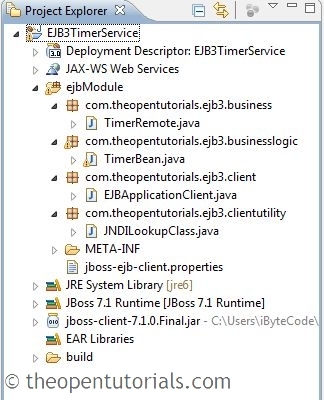 This EJB3 Timer tutorial explains how to create EJB3 timer service in stateless session bean. Client invokes a method which creates a timer and when timer expires the container invokes the timeout method. This example is deployed in JBoss application server. 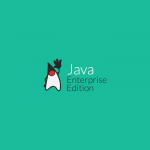 For testing this example we create a remote Java Application Client (main()) which is created in the same project as session bean. The figure below shows the final directory structure of this example. Create business interface “TimerRemote” in package “com.theopentutorials.ejb3.business” and copy the following code. Create the bean implementation class “TimerBean” in package “com.theopentutorials.ejb3.businesslogic” and copy the following code. Here, the timer expires every 24 hours. Create client utility class “JNDILookupClass” in package “com.theopentutorials.ejb3.clientutility” and copy the following code. Create client class “EJBApplicationClient” in package “com.theopentutorials.ejb3.client” and copy the following code. We use JBoss AS 7.1 and EJB3.1 look up naming convention. If the application server uses EJB3 look up naming convention, (JBoss AS 5 or 6) then the following lookup name should be used. JBoss AS 7 -> refer this page. JBoss AS 6 -> refer this page. JBoss AS 5 -> refer this page.